Oakhurst Neighborhood Association, Fort Worth, Texas: More Oak Leaflets Online! 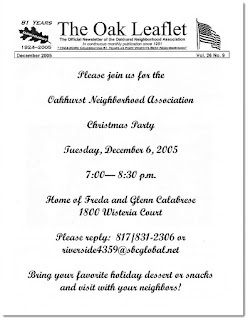 Thanks to Oakhurst neighbors Charles and Karen Cerulla, I'm happy to report that we've added another 25 past issues (2003-'05) of the Oak Leaflet to our Newsletter Archive page. We are now close to having the past 15 years of the newsletter available to you online. Click on the link above to view, download, or print them today! While I'm thinking about archives...we are always looking for media from past neighborhood events, as well as stories that bring to life the rich history of Oakhurst. If you have photos, videos, clippings, or other media to share, please let us know. And thank you for your continued support of ONA!